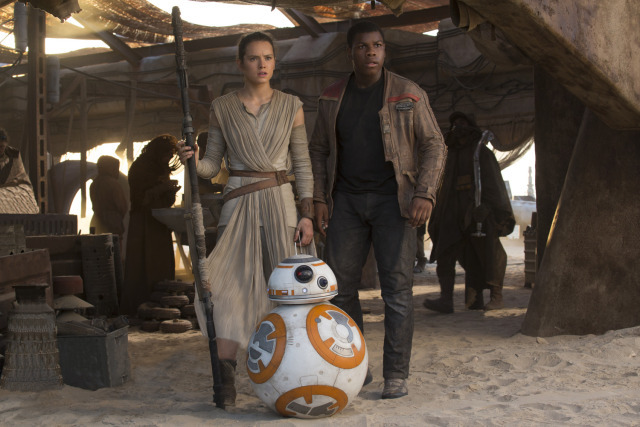 “Star Wars: The Force Awakens” showed no signs of slowing down, heading into what is expected to be a hugely profitable Christmas holiday. The seventh film in the space saga earned $38.1 million on Wednesday, pushing its domestic haul to $363.5 million. Internationally, the film picked up $38.4 million, bringing its global box office receipts to $765.9 million worldwide. At this rate, “The Force Awakens” is outpacing the likes of “Avatar” and “Jurassic World,” emboldening analysts to project it will end its run as one of the highest grossing films in history. The pic should earn $1 billion by the end of the week, making it the fastest picture to breathe that rarefied air. It’s a busy time of year for moviegoing. On Friday, the Will Ferrell and Mark Wahlberg comedy “Daddy’s Home,” the action adventure remake “Point Break,” the Miracle Mop maker biopic “Joy” and the Will Smith drama “Concussion” all debut in wide release. The influx of new films and the continued dominance of “The Force Awakens” have ticket sellers such as Fandango reporting that advance sales are reaching record levels. Paramount expanded “The Big Short,” its financial crisis comedy, to solid results, picking up $2.3 million after moving from eight theaters to 1,585 locations. The picture has earned $3.8 million since debuting last month. Christian Bale, Steve Carell and Ryan Gosling star in the film from “Anchorman” director Adam McKay. Holdovers, “Alvin and the Chipmunks: The Road Chip” and the Amy Poehler and Tina Fey comedy “Sisters” were just ahead, pulling in $3.4 million and $2.5 million, respectively. The latest “Chipmunks” tale has earned $24.7 million, while “Sisters” has generated $21.8 million. “The Force Awakens” is directed by J.J. Abrams, who previously revived “Star Trek.” It is a hit with most major critics and has received strong word-of-mouth, with audiences handing it an A CinemaScore. The picture is set three decades after “The Return of the Jedi,” and finds the Resistance doing battle with a new enemy. Disney is backing the $200 million production. The media company spent more than $4 billion in 2012 to acquire LucasFilm, the creator of the “Star Wars” and “Indiana Jones” franchises.